The Global CCS Institute is supporting the development of the CarbonNet Project through a series of reports and enable the sharing of knowledge throughout its development. The CarbonNet Project is in its feasibility phase and planning the development of a hub-based network that will centre on a large capacity pipeline to deep, secure storage sites, offshore Victoria, Australia. The Project is planning to store up to 125 million tonnes over 25 years in the Gippsland Basin. The Gippsland Basin holds world class geologic formations for CO2 storage with multiple 100-150m thick, multi-Darcy, clean quartz-dominated sands, overlain by thick caprocks. The ideal geologic conditions means that the CO2 will be mobile and enable accurate plume prediction modelling which is critical during this phase of CarbonNet's site characterisation. 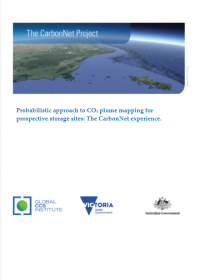 Moreover, in Australia storage regulations require plume path predictions with more than 10 per cent probability, that is 90% confidence of the CO2 plume's movement throughout the project’s lifecycle. Because of the petroleum industry’s decades of experience in modelling and probabilistic analysis, CarbonNet has been able to adapt this expertise for CO2 storage modelling in the Gippsland Basin. The modelling focussed on a large anticlinal structure in the near shore Gippsland Basin, with an injection point down dip from the crest of the structure. The modelling and probabilistic analysis found that the variations in input data for porosity, permeability and residual gas saturation strongly affect the horizontal and lateral movement of the plume in the formations. The simulation modelling was completed over seven time frames from 10 years through to 300 years after injection commences. The analysis found that after the injection of 125 million tonnes, the CO2 plume migrated into the anticlinal structure but never moved outside the structure. CarbonNet's CO2 plume modelling methodology enables a quantified plume path uncertainty analysis both laterally (i.e. map view) and vertical extent (cross-section), offering 3D understanding of plume containment. This report confirms that containment can be demonstrated with an appropriate high level of regulatory and public confidence.